Grace's parents (her mother) had been against this marriage because they felt he was beneath her. Grace went ahead with the marriage but it was not a happy union, she suffered from a great deal of depression according to son Walter. This was a double wedding because Grace's sister Sarah and Robert E. Ross were married as well. 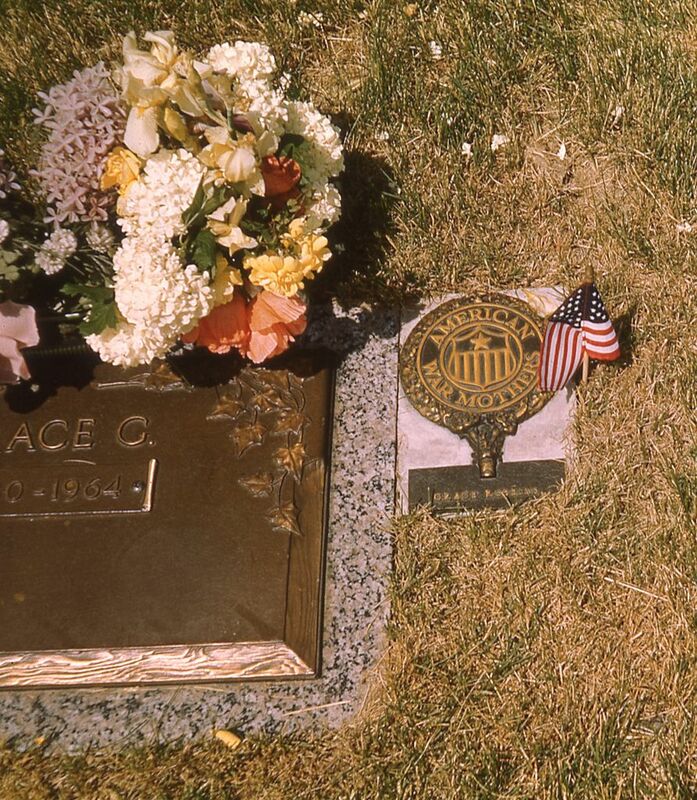 Oscar and Grace began their married life on 14 September 1910 in Hamilton County, Indiana. Their wedding was a double wedding with Grace's sister Sarah and Robert E. Ross getting married on the same day. 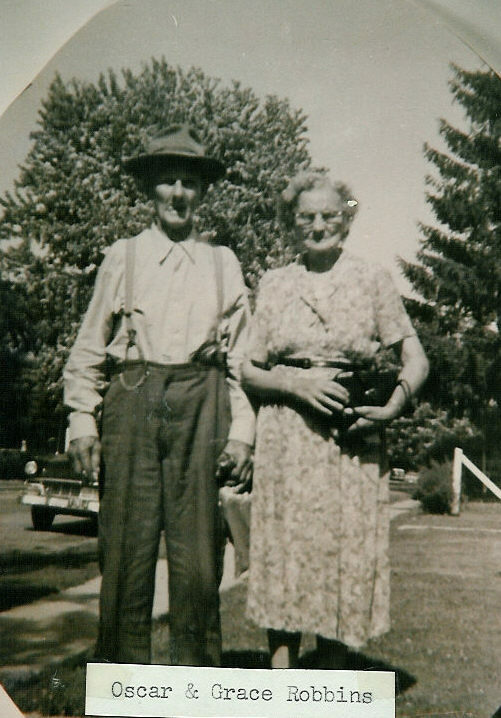 Although no records have been found to support it I would venture a guess and say that the marriages probably took place in the home of the George Foulke Farm on present day 236th street about 5 miles west of Cicero. 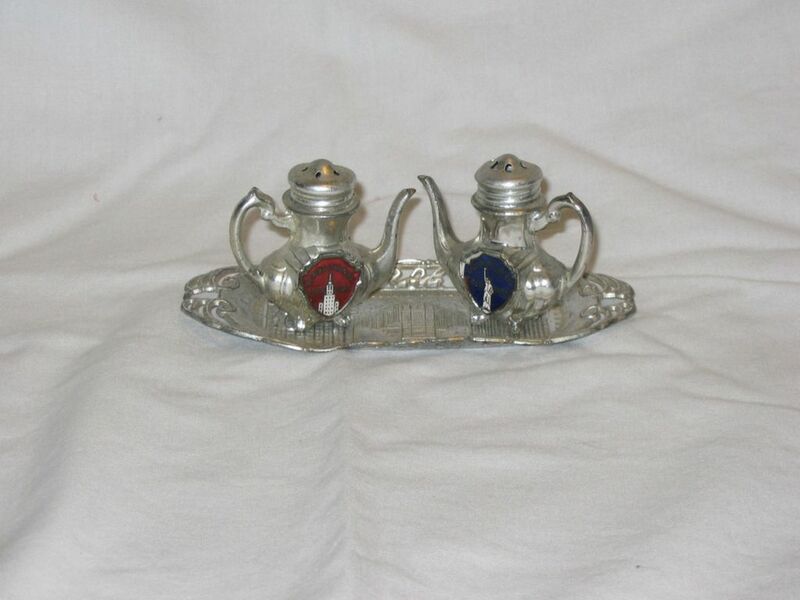 The union of Oscar and Grace lasted until Feb 1959 at the death of Oscar and Sarah was widowed in Aug 1964. This farm was about 80 acres in size. They had 15 or 20 head of milk cows, horses and Poland China hogs. 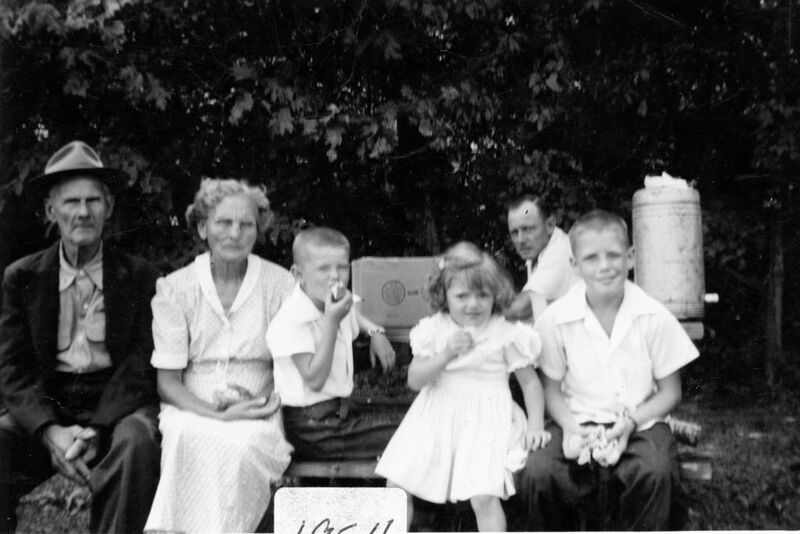 Grace had 500 chickens and traded the eggs for groceries – they sold the cream from the milk and fed the milk to the hogs. abt March 1921 Cadiz Farm House Burned - The fire started in the smoke house, probably from a ham falling into the fire. Some men from Cadiz came out but were not successful in putting out the fire and the house was a total loss. Residence: Scott Farm - Following the fire the family moved to a farm owned by Mrs. Scott. 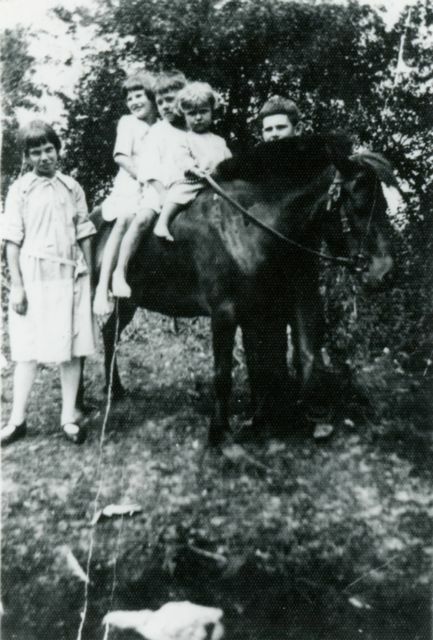 They lived at this farm for a time and then moved to the Shirley Farm. The family probably rented this farm, but they did run it for Mrs. Scott. Residence: Shirley Farm - The family rented this farm from a banker. The owner supplied the money for supplies and they built a silo while living there. 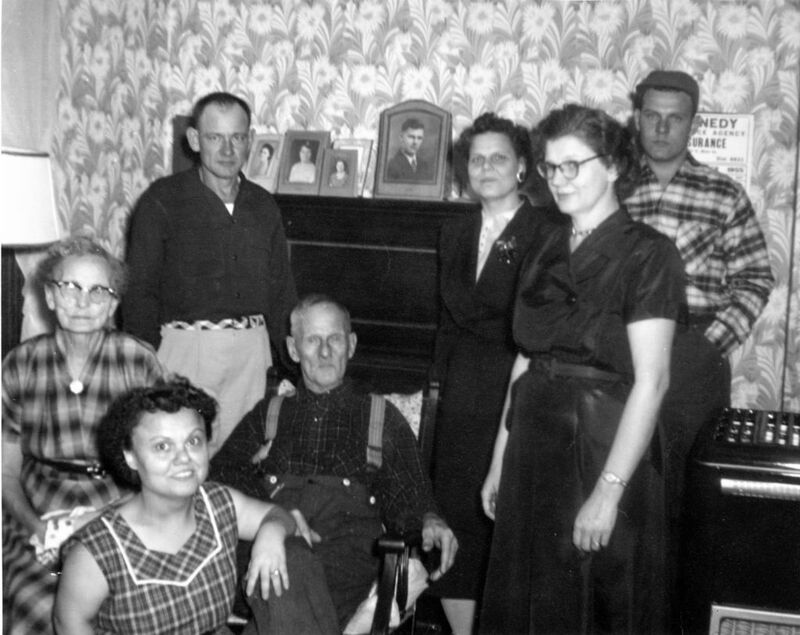 -- The family evidently moved back to the Cadiz farm once Oscar was finished building the new house. 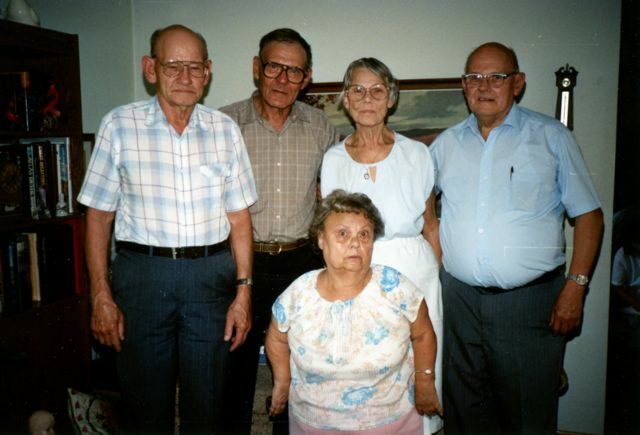 The kids all went to Cadiz School and the oldest child, Myron, graduated from Cadiz in 1930. -- The new house consisted of an old house that Oscar bought, cut in half, moved to the Cadiz farm location and put back together. He finished it and added porches. 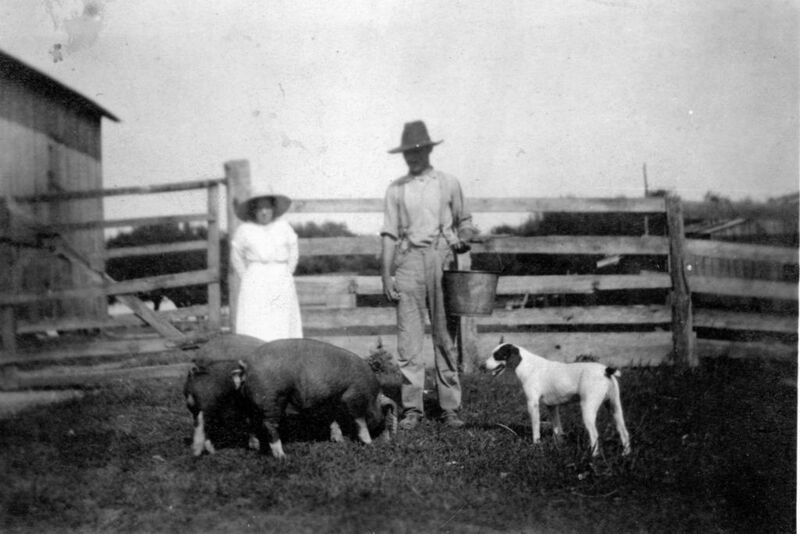 -- The family lost this farm because they could not make the payments during the depression. 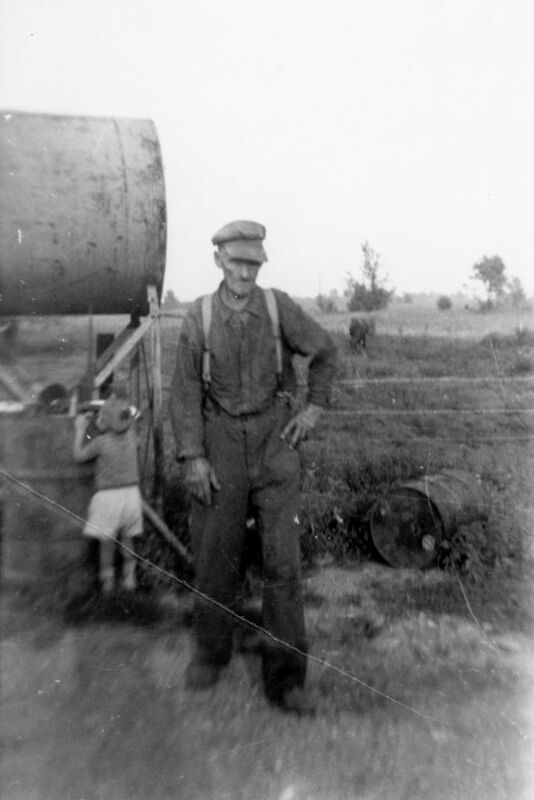 -- This move took place in late 1929 or early 1930 because son Myron lived with a friend’s family so he could finish school and graduate from Cadiz in Henry County. -- This was the farm of Grace’s mother where she had lived as a child. -- Oscar, and Grace’s brother Arthur, were attempting to save the farm from foreclosure. 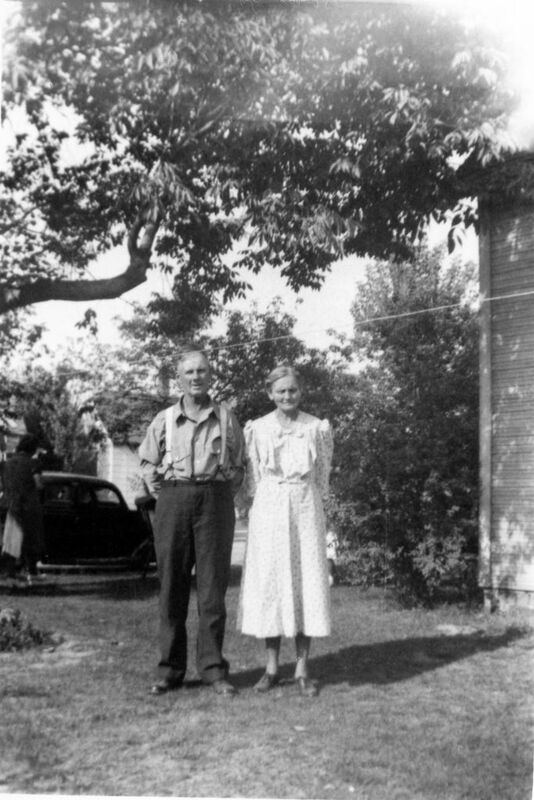 Mary Francis was in debt because she had signed notes to Robert Ross, her son-in-law while he and his wife had been living on the farm. -- This was a farm consisting of about 100 acres. 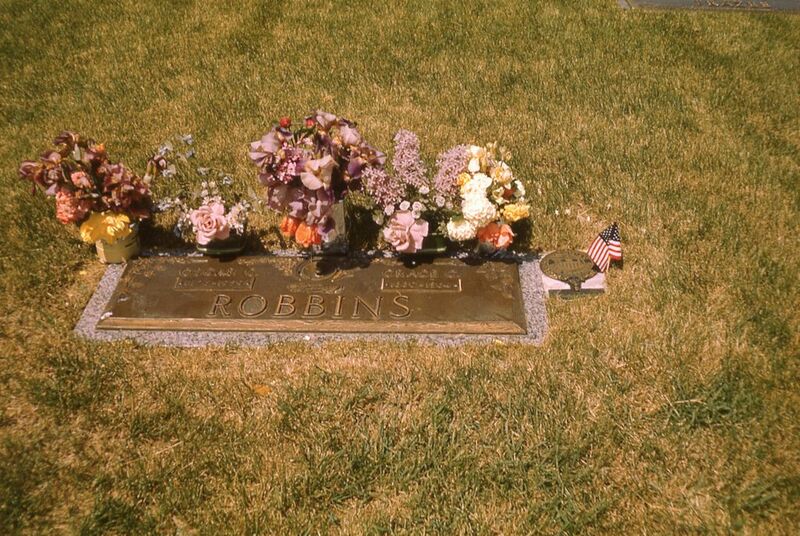 -- Oscar and Arthur were not successful in saving the farm and after the death of Arthur from suicide in June 1934, the Robbins family moved once again. --This farm was in Green Township and was located on what is now County Road 100N, .67 miles east of County Road 1150W. 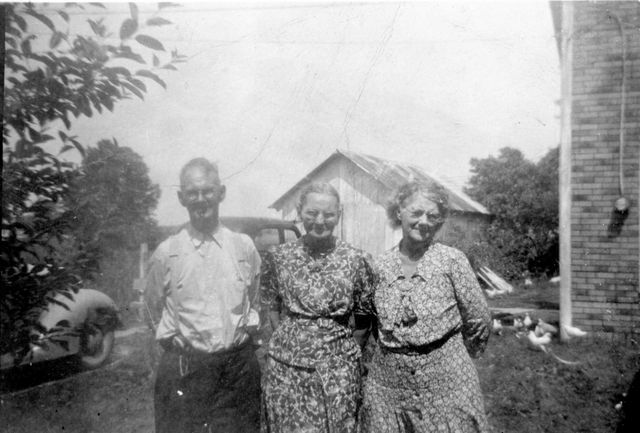 -- This is the first farm the family bought after losing the Cadiz farm in 1930. 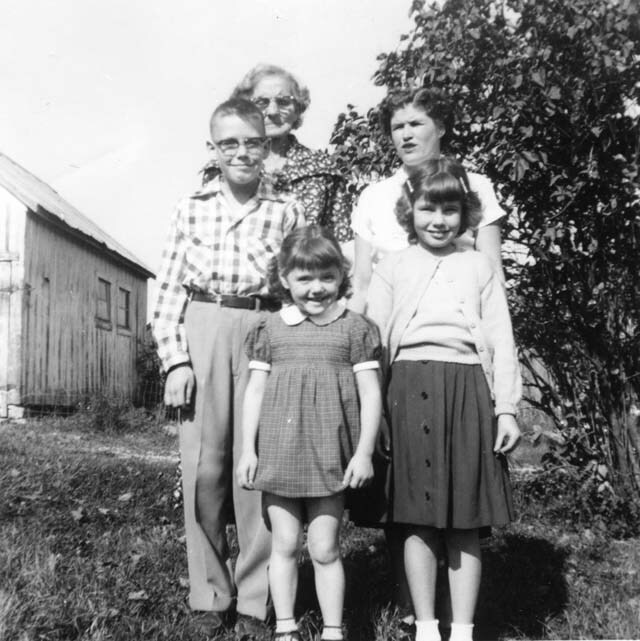 -- The family moved to this farm in about 1937 or 1938 and sold it in about 1943. 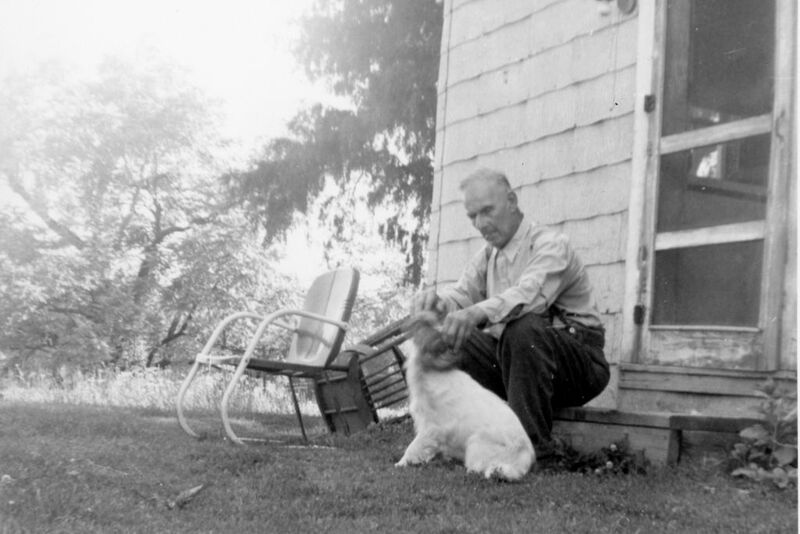 -- Once Walter left for World War II Oscar was not able to do the farming by himself so he he traded it for a smaller farm in Delaware County that he ended up owning free and clear after the trade. -- This was a 40 acre farm that had a small house, a barn and some other outbuildings. 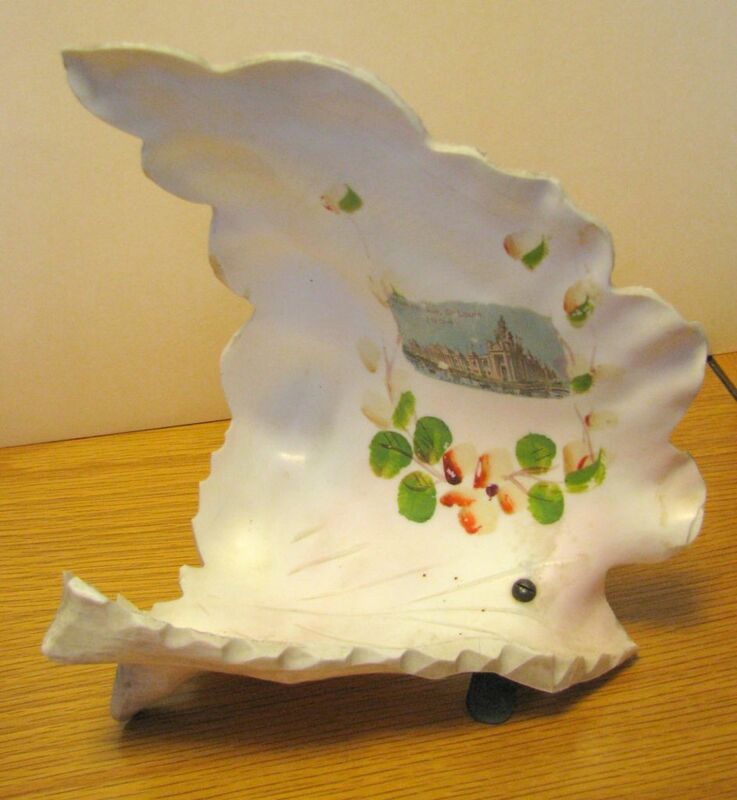 -- By this time all the children had moved away with the exception of son Milton. 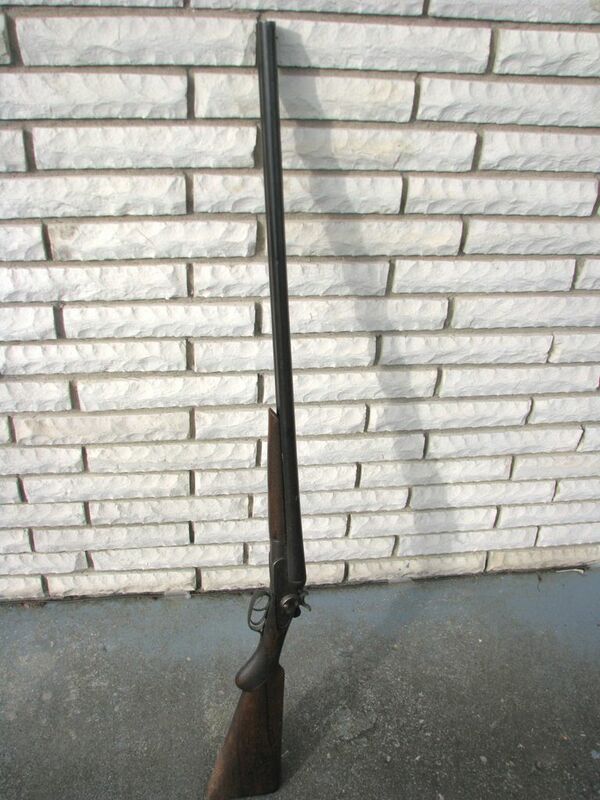 -- This farm was about 140 acres with land in both Delaware and Blackford Counties. 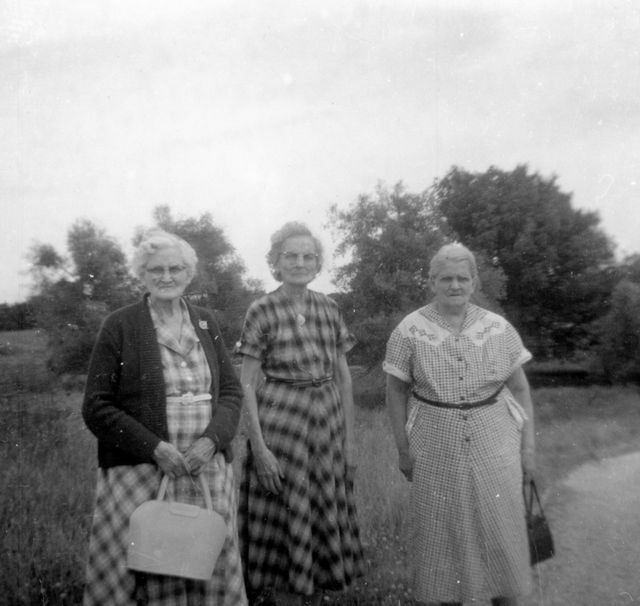 -- The farm was located on what is now Delaware County Road 1270N, and about 1 mile northwest of the Cole farm. 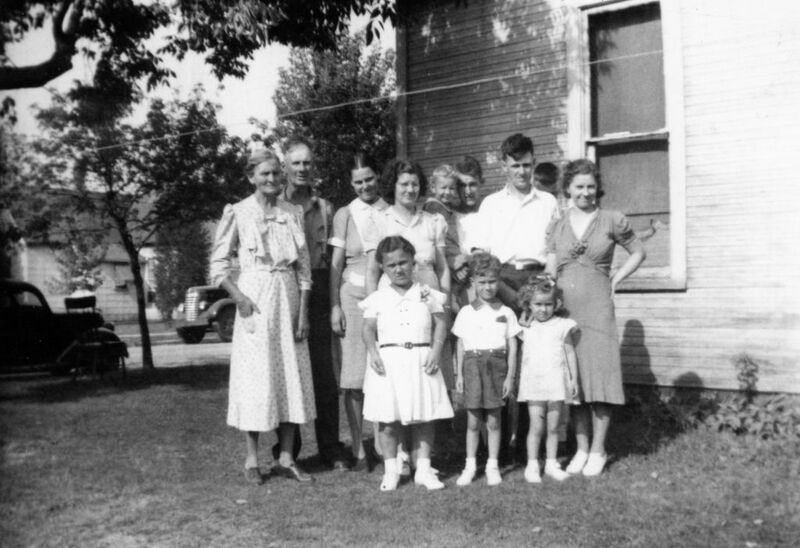 -- The family moved to this farm about 1947. -- Walter had purchased an adjoining farm and was once again helping Oscar run his farm. 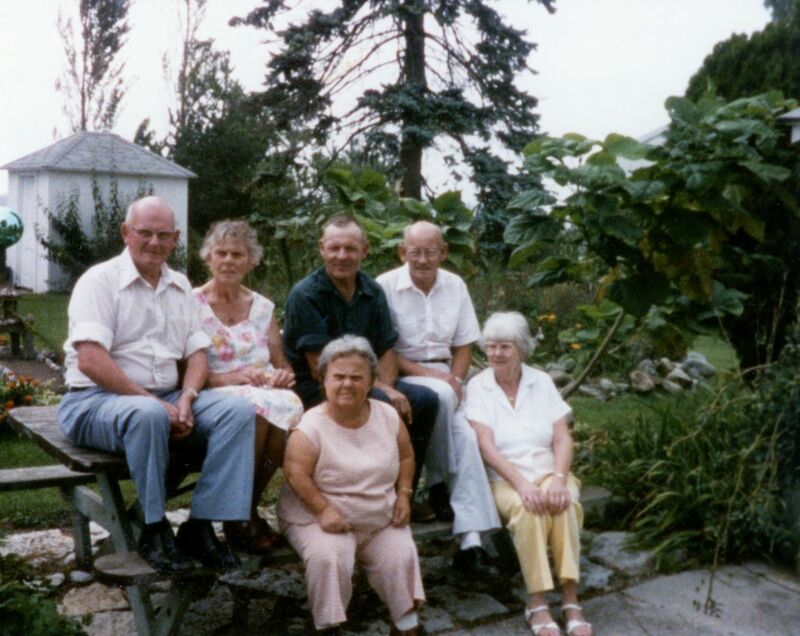 -- This farm had a small 2-story house, a large barn with silo and several outbuildings. 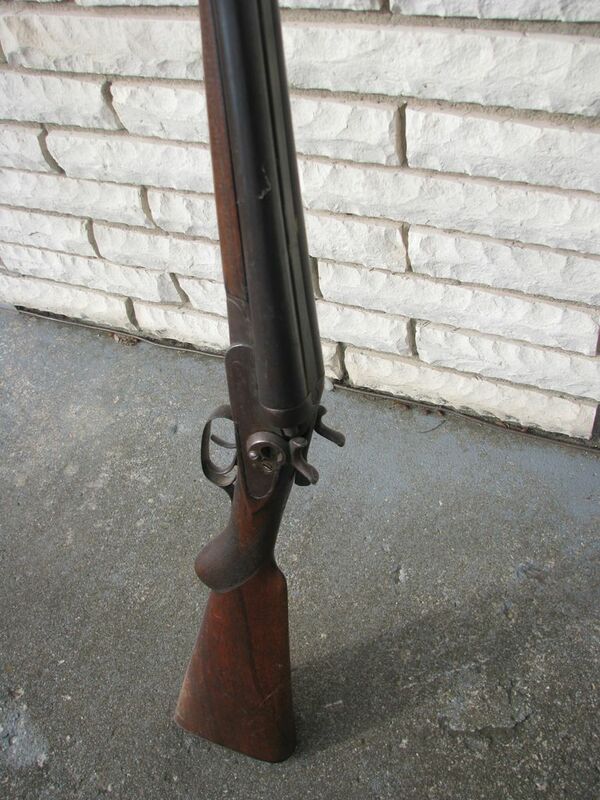 It also had a large wood with a winding stream. -- On the Blackford county side of the farm was a windmill and rolling hills that were not tillable and was used for pasture. -- Oscar lived here until his death in February 1959. 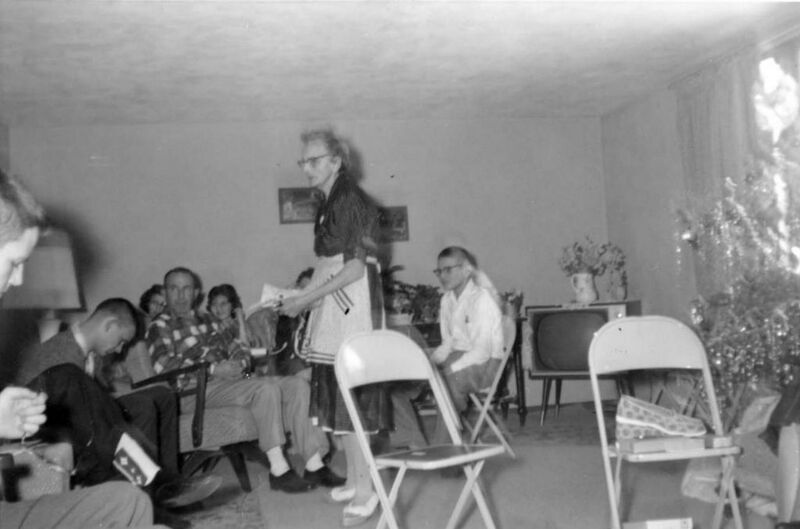 Aft 1959 Residence - Grace: Following the death of Oscar, Grace moved into a small yellow ranch style house in Eaton, Delaware County, Indiana. This was a lovely home and she made many friends at church and through her membership in the Eaton War Mother’s club. This home was located at 301 Jefferson street, on the south side. She had fallen ill and been taken to the hospital for treatment but unfortunately did not recover. -- I can remember as a child that Oscar got tired of the grandkids pounding on the piano and nailed the keyboard cover shut. That seemed cruel at the time but in retrospect I can now see the value in the action. 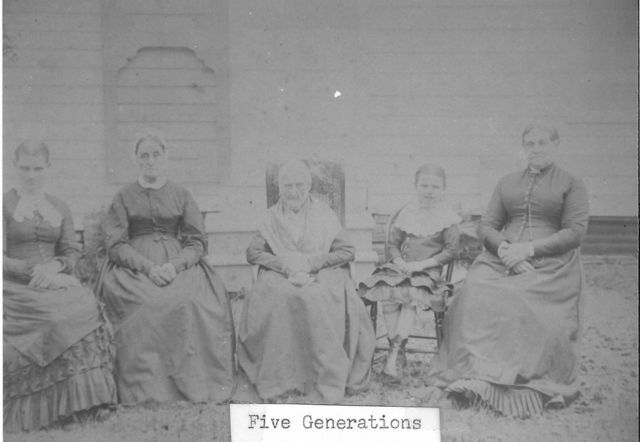 Farm wife: She was involved with the care of the six children and the house as well as being in charge of all the meals. Acc000523 [Feb 2008] When I told Dad that I had found records that his mother had attended DePauw he admitted that he was probably mistaken and that she had GONE to St Louis WHILE she was in college and not that she had actually attended college in St Louis. 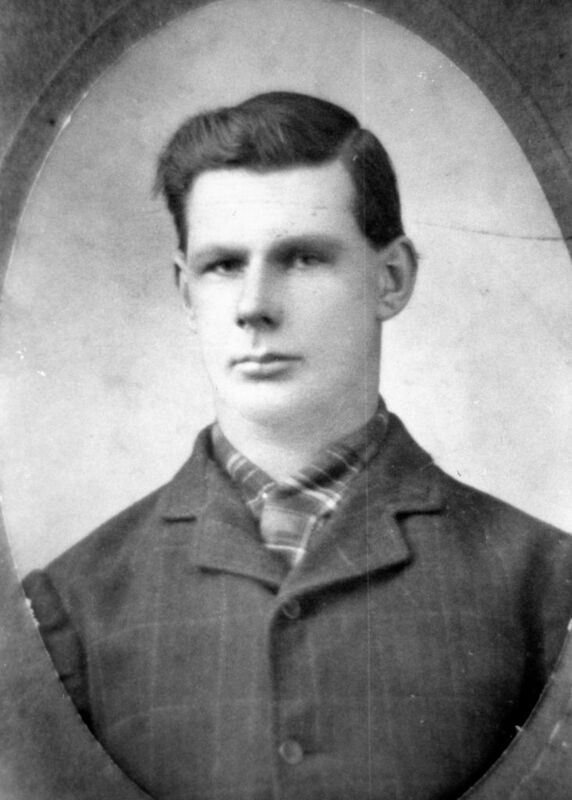 My Grandfather, Oscar Clifton Robbins was born on the 9th of February 1876 in Hamilton County, Indiana near the small town of Westfield. 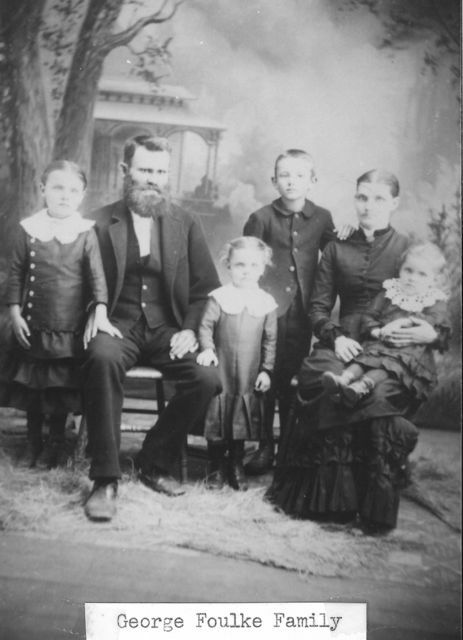 He was the son of farmers and was one of four children, 3 sons and one daughter. 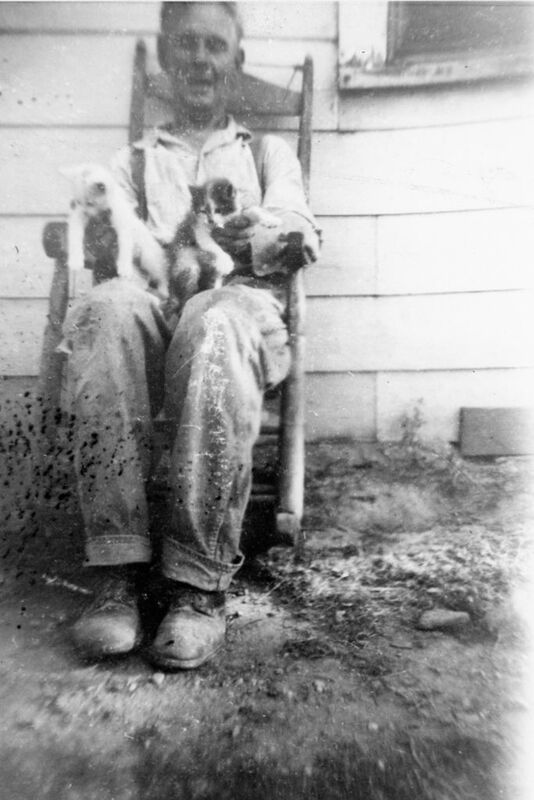 Probably in the 1890's or so he and his older brother Christopher Columbus played at barn dances in Westfield. Oscar played his violin and Christopher his guitar. 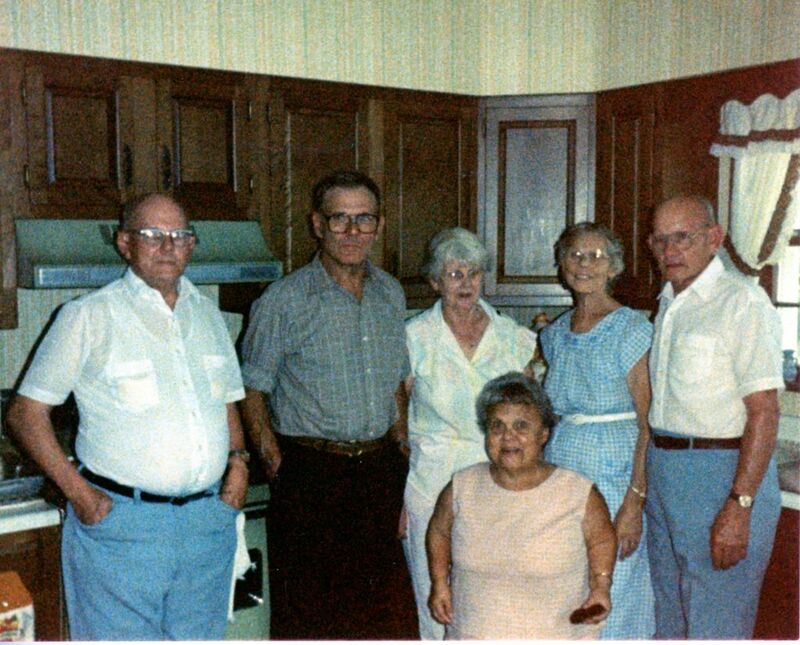 I can remember as a youth being at my grandparents home on the weekends. Aunt Esther would come home and stay at the farm on the weekends and I really enjoyed visiting with her. Her bedroom was upstairs and there was also an attic type space off that room. 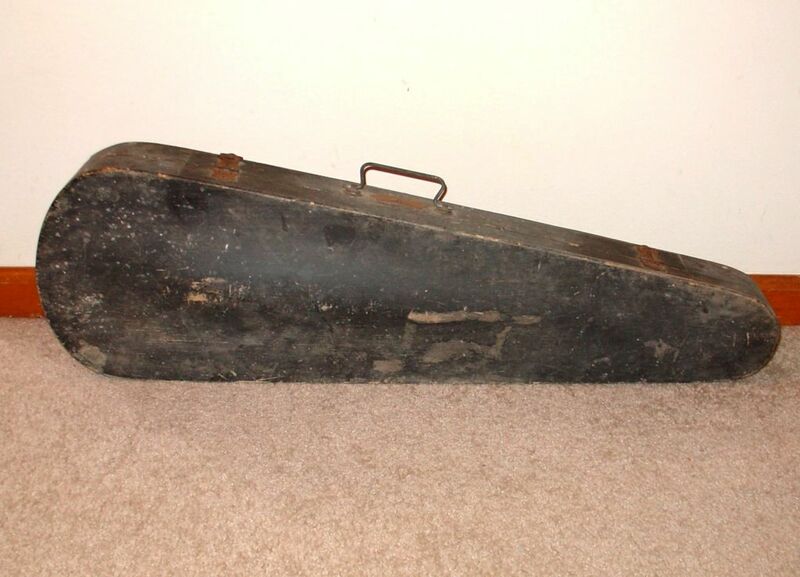 I can remember her getting this case out of the attic and showing the violin to me. I well imagine that she told me about the guitar and what the significance was to Grandpa, but I cannot really remember anything beyond seeing it. 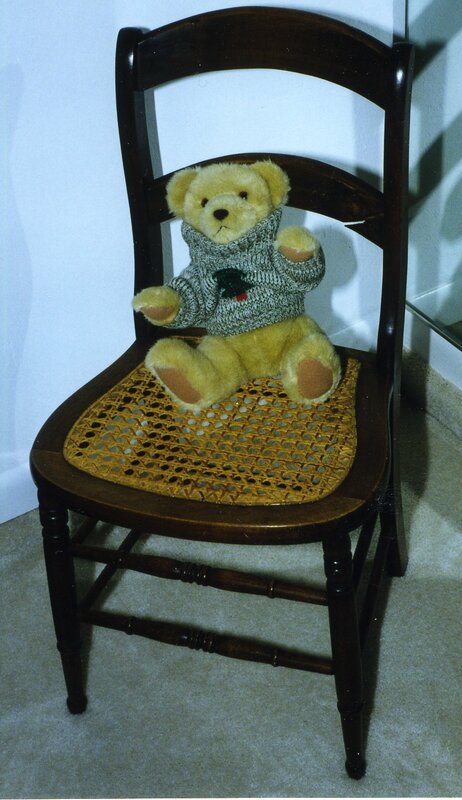 Later in life I conducted several interviews with my father about his life experiences. During one of these talks he spoke about Grandpa and Christopher playing in Westfield. I asked if Grandpa had played for the family and Dad said that he had never heard his dad play the violin. He had only heard the stories from his dad and a little from his uncle Christopher. There was a piano in the home but music did not seem to be an important part of the family life according to my father. Dad did not know how Grandpa learned to play or if he played at other events besides the dances. My father ventured the opinion that Grandpa probably didn't have time to play after his marriage in 1910 because he was too busy working and providing for his growing family. 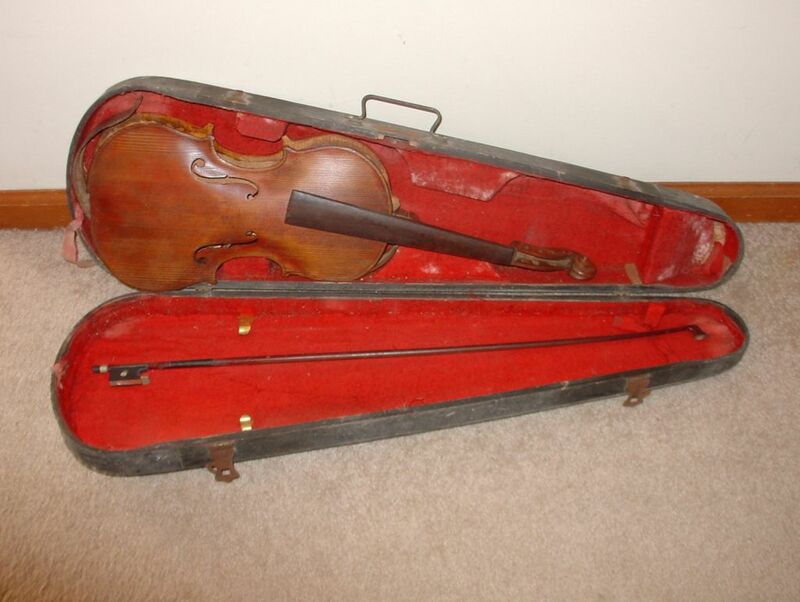 After my Grandfather passed away in Feb 1959, the violin and the guitar found their way into the possession of Oscar's son, Myron Foulke Robbins, Sr., and he kept them on display at his home for many years. After his passing both instruments were passed down to Myron's daughter where they remain to this day. 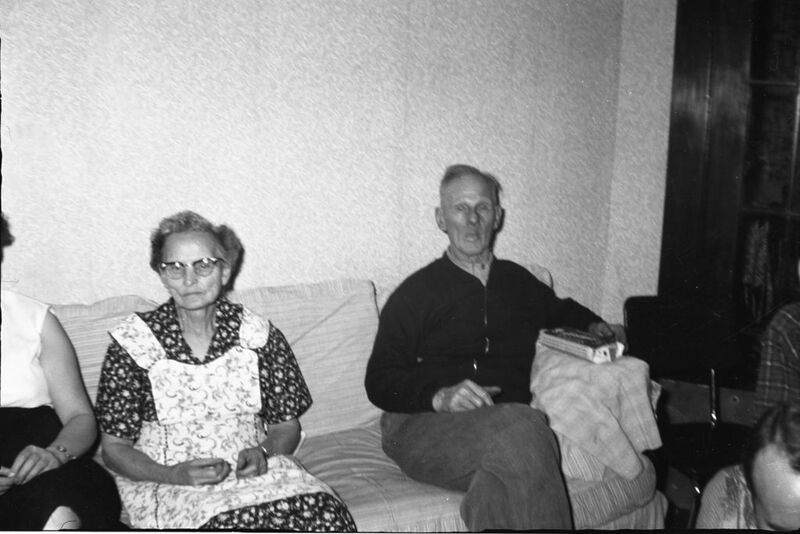 Extract: "Name: Grace Foulke - Spouse: Oscar Robbins - Parents: George Foulke, Mary Francis Underwood - Birth Place: Hamilton CO, IN - Birth Date: 3 Feb 1880 - Marriage Date: 14 Sep 1910 - Death Place: Eaton, Delaware Co, IN - Death Date: 13 Aug 1964"
Extract: "Name: Oscar C Robbins - Spouse Name: Grace G Foulke - Marriage Date: 14 Sep 1910 - County: Hamilton"
Extract: "Foulke, Grace G Oscar C Robbins 14 Sep 1910"
"World War 1 Draft Registration Cards, 1917-1918", Oscar Clifton Robbins. Original Data: Selective Service System, NARA Roll M1509_1503897. 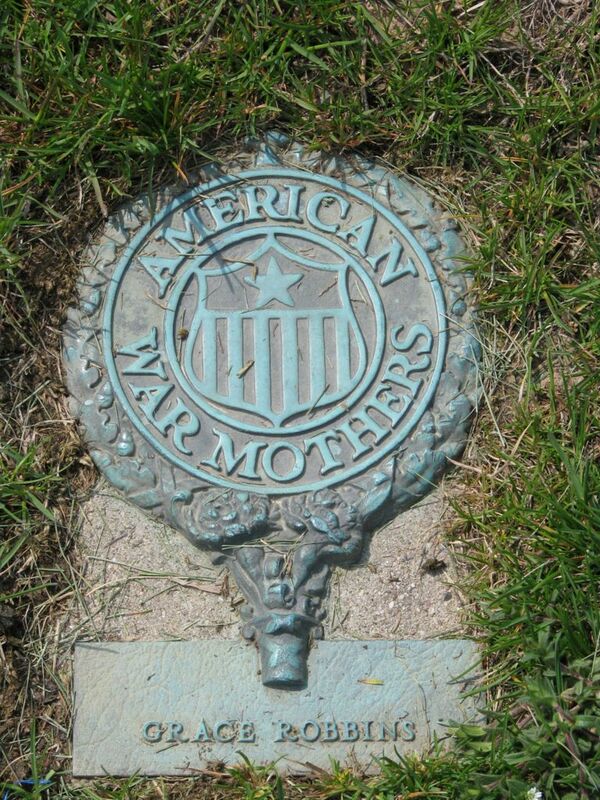 www.ancestry.com, accessed 4 May 2018. Acc000638/Doc1733-001.pdf. As you know Xmas is not very far away and Mary and I were trying to plan something. I don't have very much room in my house, so, she wants to have a family get to gether in her home. We are going to have it in the afternoon on Dec. 22. A dinner but no presents. See if that plan will not work better. There is 39 now in our family and hope most if not all will come. Do come early so you can have time to visit and have a good time. I imagine you have several cousins you wouldn't know if you met them any place. I am well as usual and getting along very well in my new trailor. 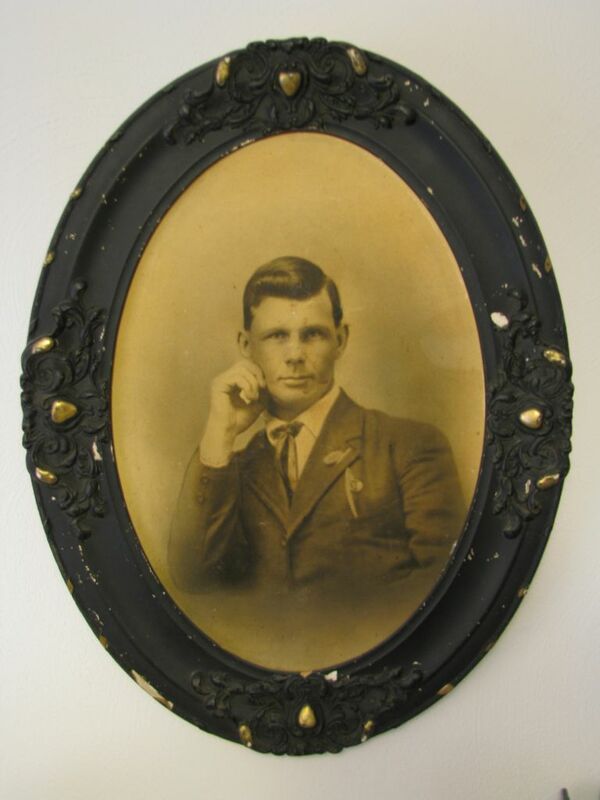 1] Isaac Robbins: Head of household - 35 yr old white male, married, Farmer - he and his parents born in North Carolina. 2] Kesiah Robbins: 29 yr old white female, married, Keeping House - She and her mother born in Indiana and her father in North Carolina. 3] Christopher C Robbins: 6 yr old white male, son, single - he and his mother born in Indiana, his father in North Carolina. 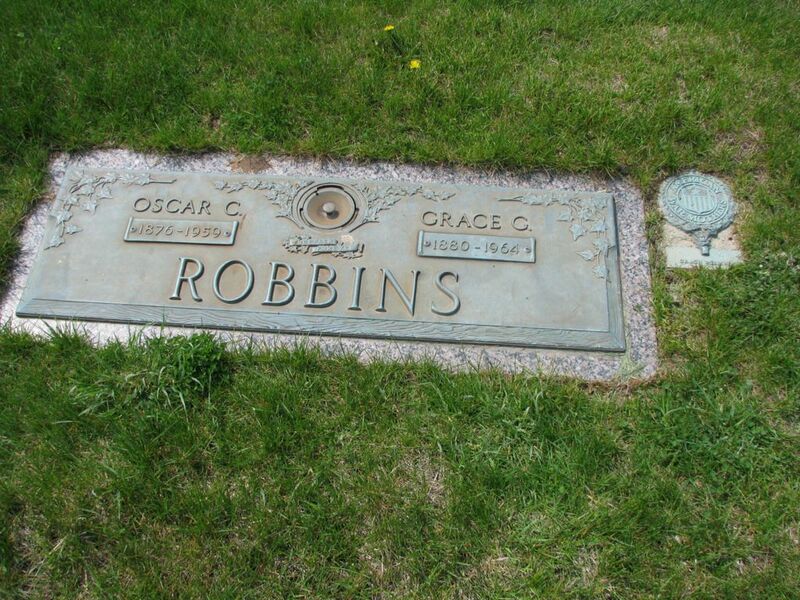 4] Oscar C Robbins: 4 yr old white male, son, single, he and his mother born in Indiana, his father in North Carolina. S11 Wayne Township, Hamilton County, Indiana. SD 9, ED 114, Sheet 8B, Dwelling 123, Household 273, Line 87, Christopher Robbinson [Robbins] Household. Census Date 28 Apr 1910. 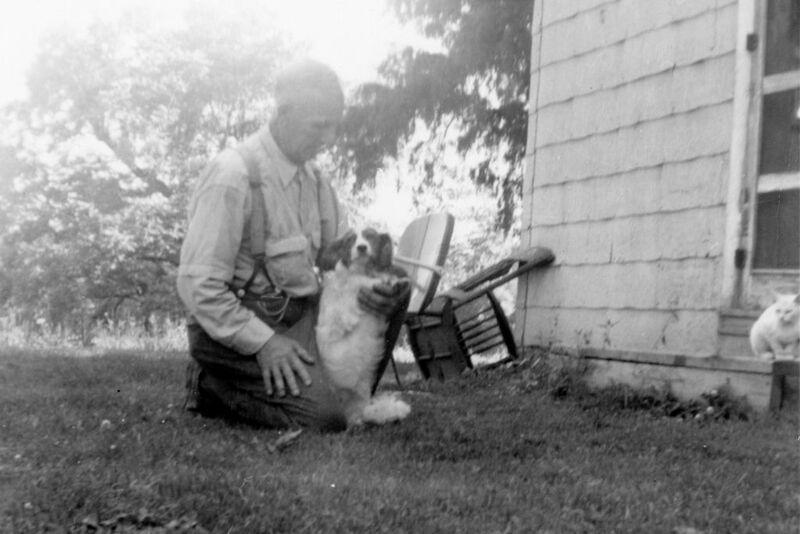 Original Data: NARA Roll T624_353; FHL microfilm: 1374366. www.ancestry.com, Accessed 17 Apr 2018. Acc001546/Doc4736.pdf. S16 Interview with Living ID0005, by RobbHaas, 22 Sept 2005. , page 10. Oscar C. Robbins, a native of Hamilton county who would have been 83 years old today, passed away Sunday evening at his residence on R. 1, Muncie after an illness of several months. A retired farmer he was born in Hamilton county, the son of Isaac and Kiziah Robbins. 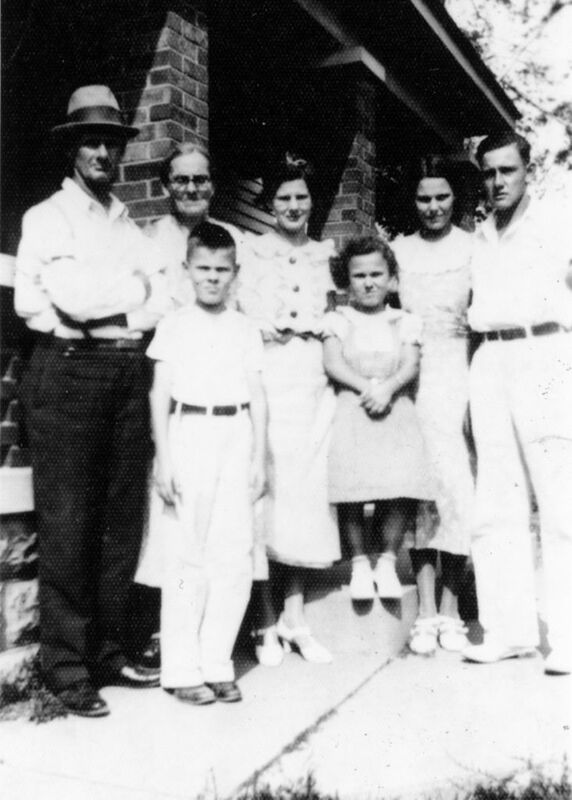 Survivors include the widow: Grace; three sons, Myron F. Robbins , of Sheridan; Walter C. Robbins, Daleville; Milton Robbins, R 1, Muncie; three daughters, Ina M. Castetter, Elwood; Mary A. Jerrell [Jarrell], Middletown; Miss Esther Robbins, Muncie; one sister, Lizzie Mallenkipf [Mallenkopf], Indianapolis; 13 grandchildren and two great-grandchildren. Funeral services will be held Wednesday at 2 p.m. (CST) at the Pitman Funeral Home in Eaton, Ind., with Rev. Russell Hall, pastor of the Eaton Methodist Church in charge. 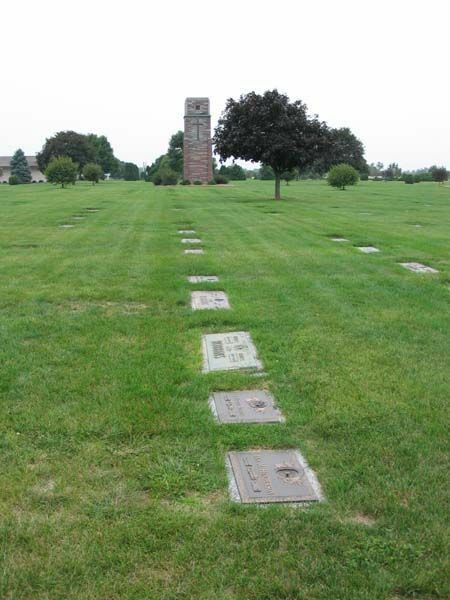 Burial will occur in Garden's of Memory Cemetery near Muncie. Friends may call after 2 pm Tuesday at the funeral home. S20 1880 Federal Census, Jackson Township, Hamilton County, Indiana. SD 3, Ed 35, P 10B, Dwelling 71, Family 74, Line 9, George Foulke. Original Data: NARA T9 Roll 281. www.ancestry.com . Acc000755/Ph7824.jpg. 2] Mary F. Foulke: 25 yr old white female, wife of head, married, House Keeping, born Indiana, parents born Ohio. S21 1900 Federal Census, Jackson Township, Hamilton County, Indiana. SD 9, ED 85, Sheet 24A, Dwelling473, Famiy499, Line 40, George Foulke. Original Data: NARA, T623, roll 375. www.ancestry.com . Acc000756/Ph7825.jpg. 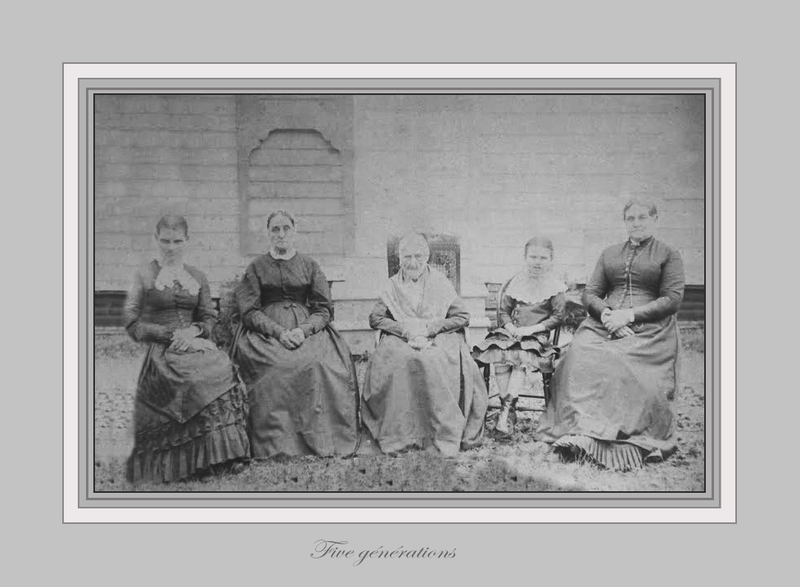 2] Frances Foulke - 47 yr old white female, born Dec 1852, married for 21 yrs - mother of 5 children all living - born in Indiana, parents in Ohio. 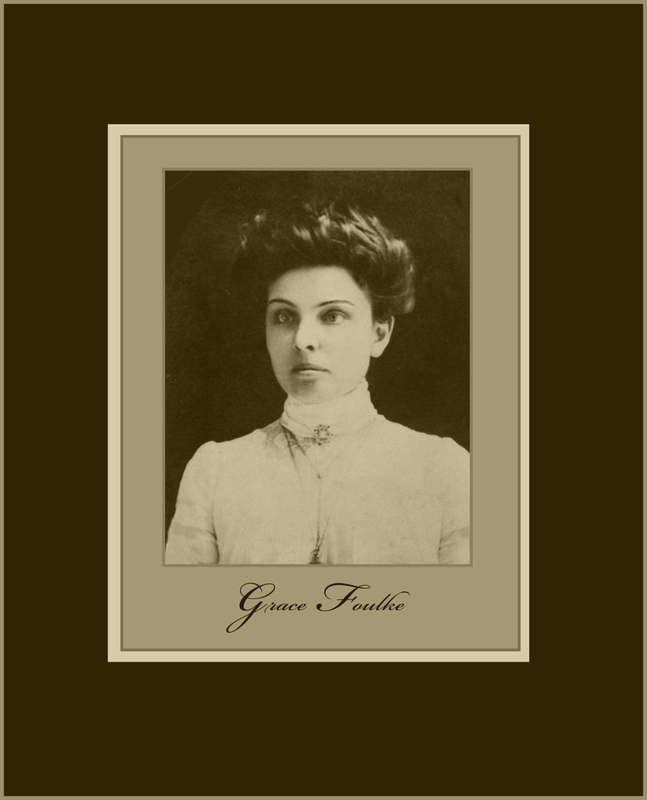 3] Grace Foulke: Daughter, 20 yr old white female, born Feb 1880, Single. 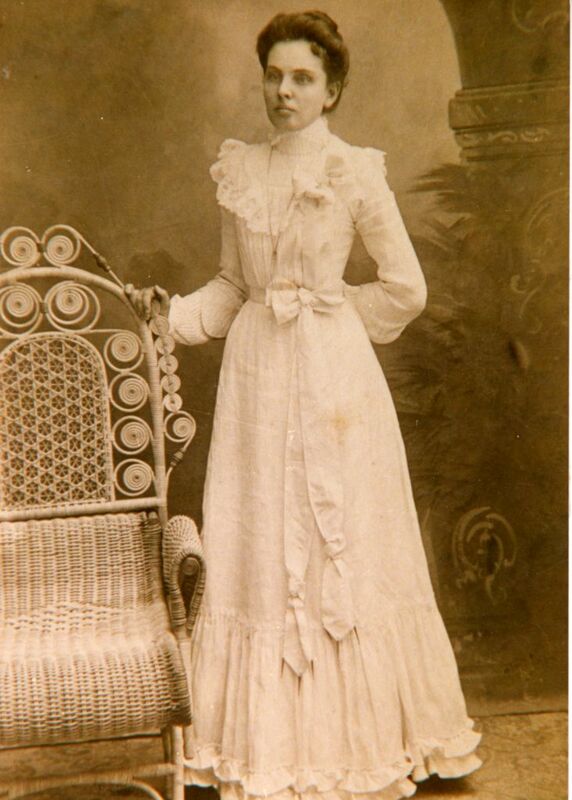 4] Carrie Foulke: Daughter, 18 yr old white female, born Dec 1881, single. 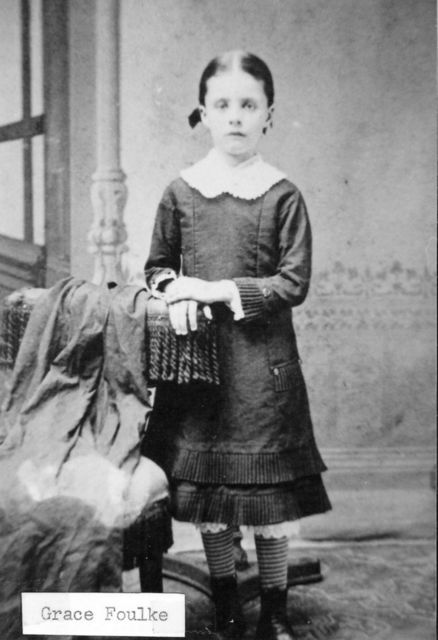 5] Alice Foulke: Daughter, 16 yr old white female, born Nov 1883, single, attended school. 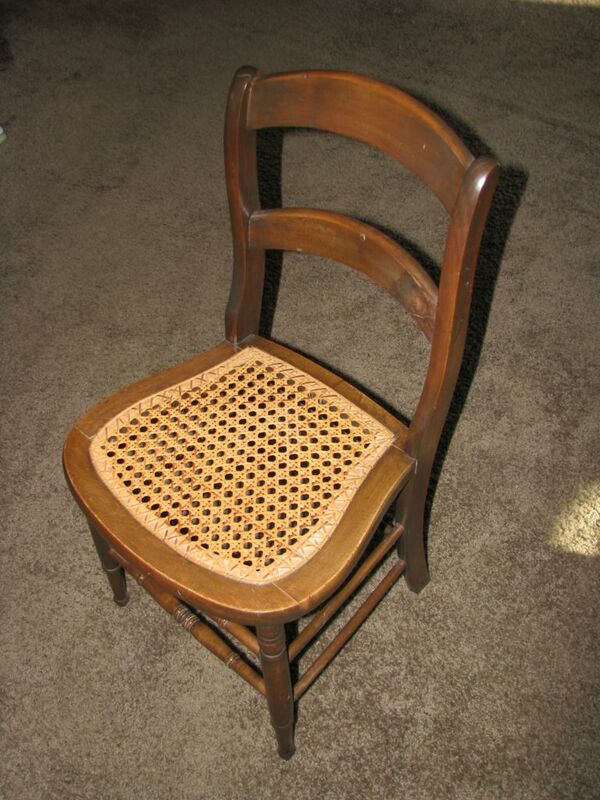 6] Sarah Foulke: Daughter, 14 yr old white female, born March 1886, single, attended school. 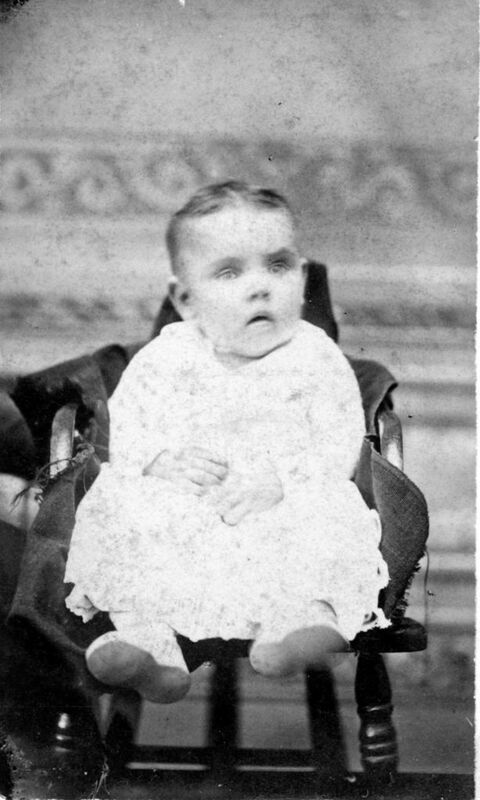 7] Arthur Foulke: Son, 6 yr old white male, born Jan 1894, single. Extract: Hello Walt, I received your e-mail and am sending the information you requested in today's mail. 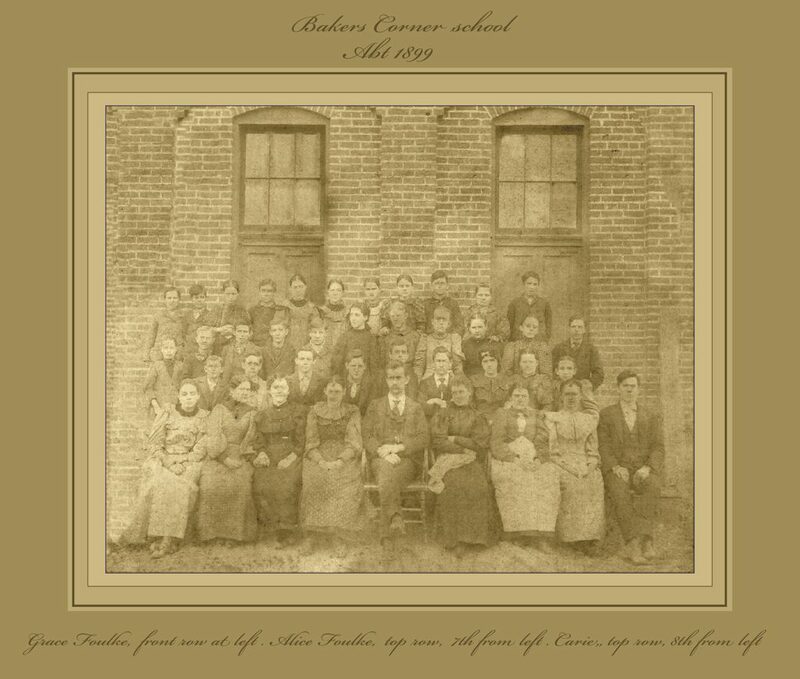 I have also enclosed copies of pages in the 1901-02 Student Yearbook in which your grandmother is listed. 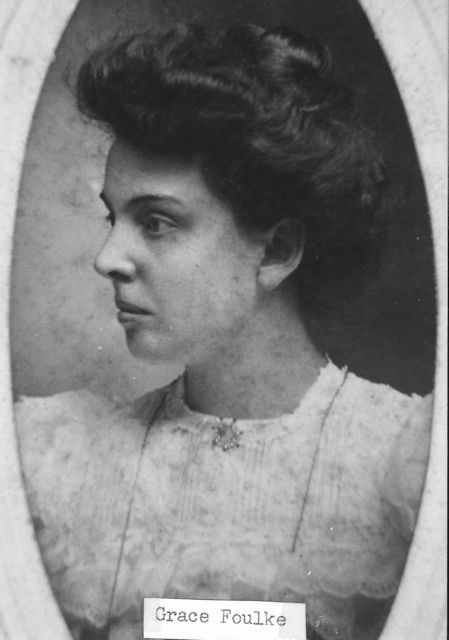 It really doesn't give us any more information, except that she was enrolled in the Asbury College of Liberal Arts (DePauw was previously named Asbury), that she was from Noblesville, IN and that she had completed 4 courses of study by May 1, 1902. She is not listed in the following three yearbooks. 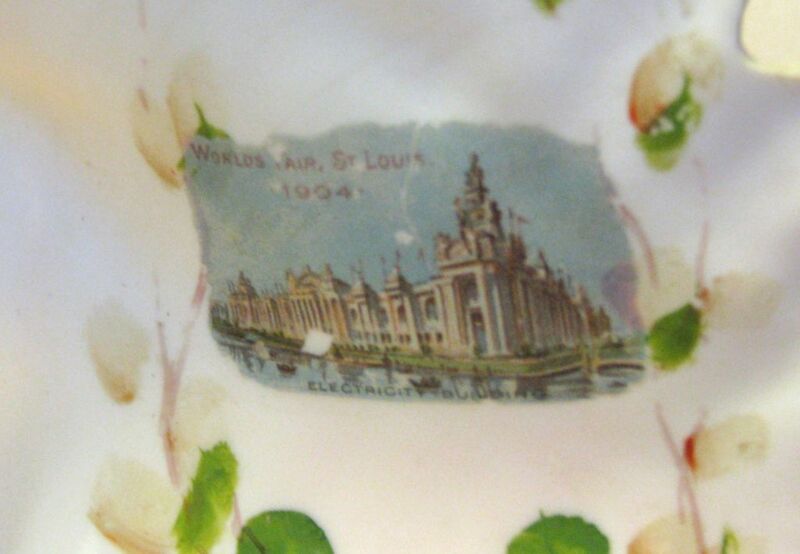 Note: [Feb 2008] When I told Dad that I had found records that his mother had attended DePauw he admitted that he was probably mistaken and that she had GONE to St Louis WHILE she was in college and not that she had actually attended college in St Louis. 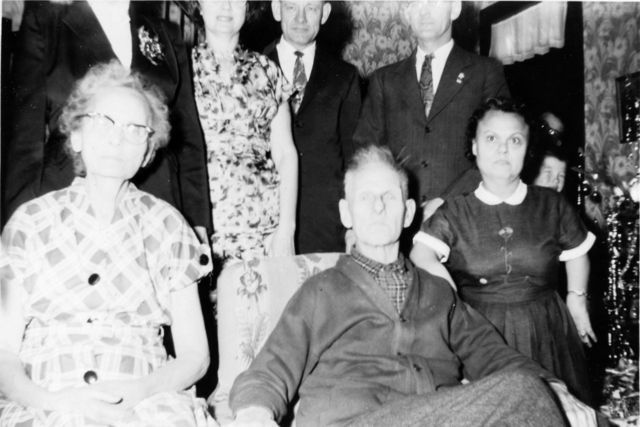 Surviving are three sons, Myron F Robbins, Sheridan; Walter C, Daleville, and Milton, Pennville; three daughters, Mrs. Paul Jarrell, Middletown; Miss Esther Robbins, Muncie, and Mrs. Louis Henderson, Elwood; a sister Mrs. Robert Ross, Chicago; 14 grandchildren and eight great grandchildren. Seal "Delaware County Health Department"
S31 Interview, Living ID0005 19 March 2002. S32 Interview, with Ina Robbins Henderson, nd. Note: stated that Grace played the piano and that she had taught Ina to play as well. 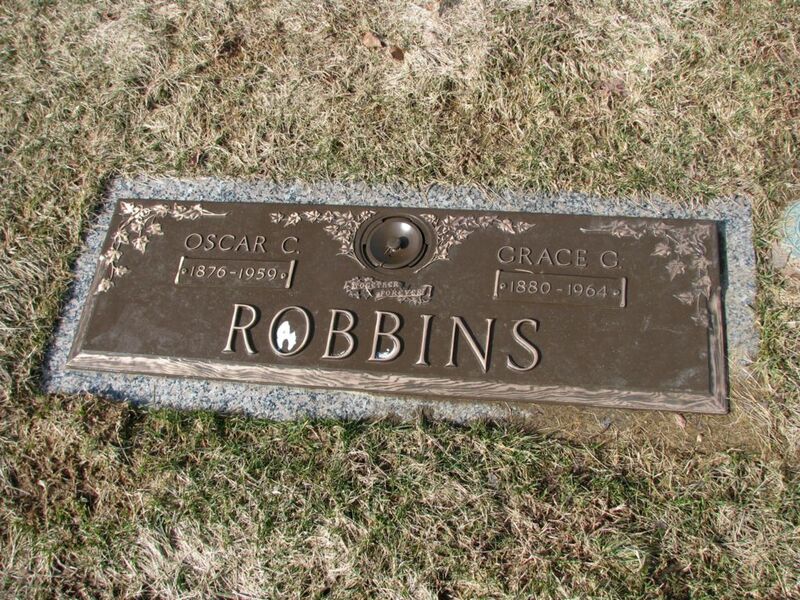 Grace Robbins, R1, Muncie, Ind. Many thanks for your commencement program we received a few days ago. 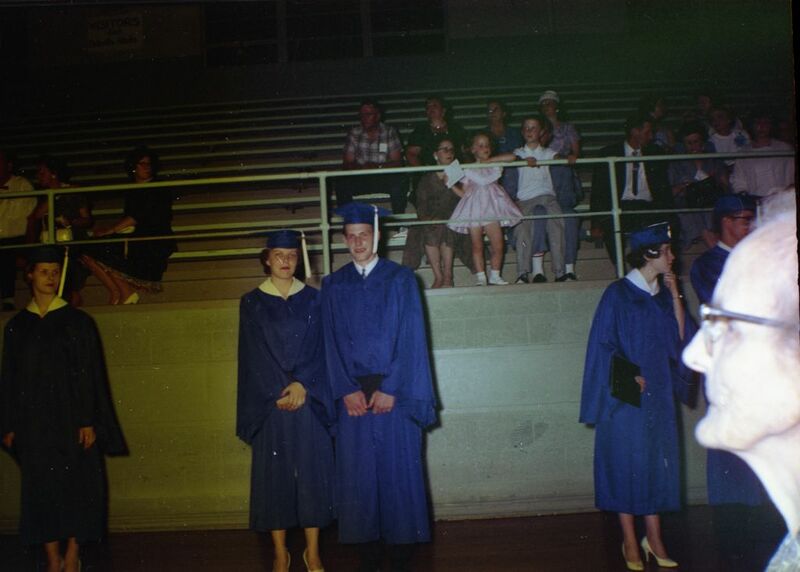 We are glad you have always had such a good school to go too and have finished high school. And it would be nice if you could make something out of your schooling. I hope you will not forget your father who has worked lots of days, where he wasn't able so you children would have the things you have needed and wanted. Wednesday morning we were looking at television and say you interviews by Hal Simons. Could see and hear you as well as if we had been there. It was quite a thrill for me and I know it was for you. We want to give you a little something, but as we do not go to town very often and don't know what you need or want will send you the money. Hope it gets there O.K. It isn't very much but maybe you can get something with it. We both wish you all the happiness and good fortune you can get out of life. Have a good time while you can. 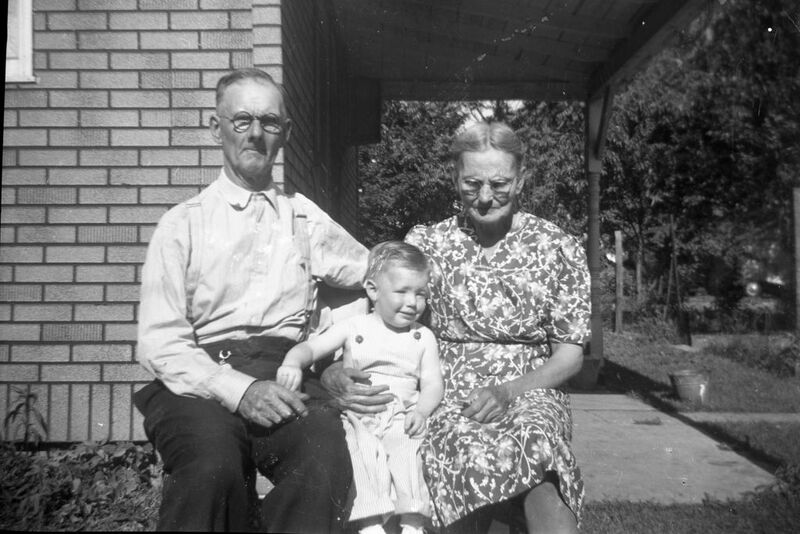 Love,/ Your Grandfather and Grandmother. We got one letter from Junior while he was in the hospital, in March, but haven't heard from him since. I answered him and Esther has written to him three times with out an answer. Hope he got better and able to go back to whatever he was doing. Expect he has found out he has gotten into something pretty serious. 1940 US Census, Population Schedule. Green Township, Randolph County, Indiana. SD 10, ED 68-3, Sheet 2B, Line 54, Household No. 37. 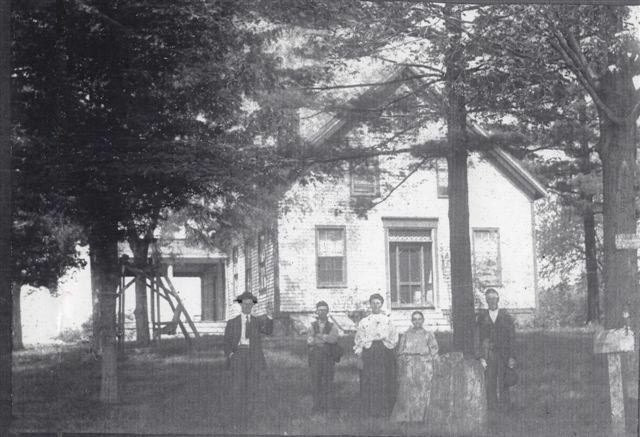 Oscar C. Robbins Household. Census Date: 8 Apr 1940. NARA Data: Roll T627_m-t0627-01089. www.ancestry.com, accessed 30 Apr 2018. Acc002130/Doc4751.pdf. S40 "Indiana, Death Certificates, 1899-2011" [database on-line]. Original Data: Indiana State Board of Health. Death Certificates, 1900–2011. Microfilm. Indiana Archives and Records Administration, Indianapolis, Indiana. Indiana Archives and Records Administration. www.ancestry.com, accessed , 14 June 2016. 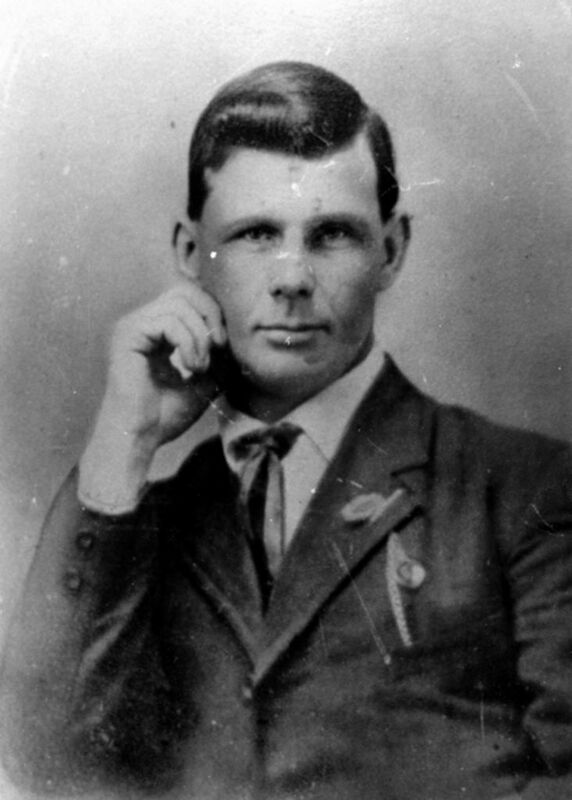 Oscar C. Robbins. 8 Feb 1959, Delaware County. Doc3549.pdf. S41 "Indiana, Death Certificates, 1899-2011" [database on-line]. Original Data: Indiana State Board of Health. Death Certificates, 1900–2011. Microfilm. Indiana Archives and Records Administration, Indianapolis, Indiana. 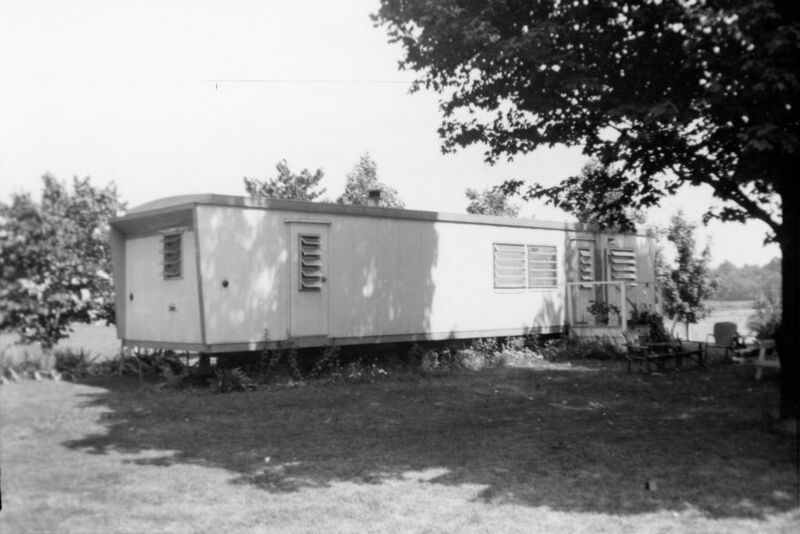 Indiana Archives and Records Administration. www.ancestry.com, accessed , 14 June 2016. 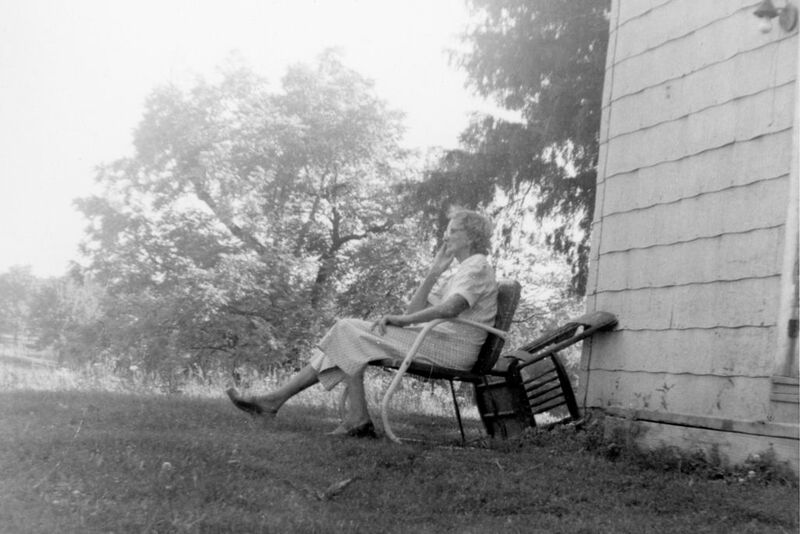 Grace Gertrude Robbins. 13 Aug 1964, Delaware County. Doc3550.pdf. Clerk of the Superior Court of Delaware County No. 2, Muncie, Indiana. In the Matter of the Estate of Grace Robbins, deceased. Notice is hereby given to all interested persons that Walter C. Robbins as Administrator of the above named estate has filed his final account in settlement of said estate and petition for distribution, and that the same has been set for hearing in said Superior Court of Delaware County No. 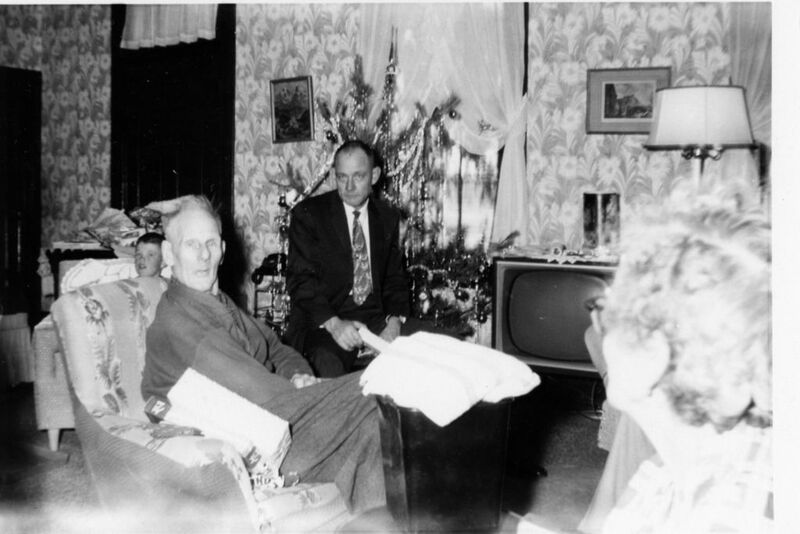 2 at the Court House in the City of Muncie, Indiana, on the 22nd day of March, 1965, at which time all persons entitled to share in the final distribution of said estate are required to appear in said Court and make proof of their heirship or claim to any part of said estate and show cause why such account should not be approved. Dated this 4th day of March 1965. Clerk of the Superior Court of Delaware County No. 2. BAKERS CORNER, Mar. 6. (Spl.) --- There are several changes taking place among the occupants f farms in this community. 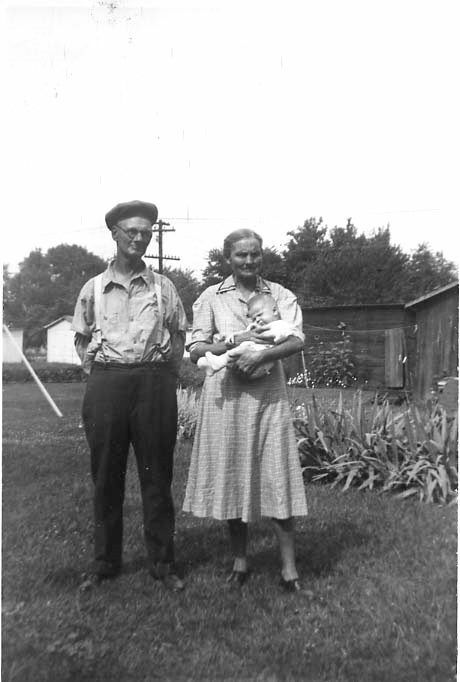 Mr. and Mrs. Oscar Robbins and family moved last week from the farm best known as the George Foulke Farm to a farm east of Arcadia. . .
S45 Newspaper Article, Noblesville Ledger (Noblesville, Indiana), 16 May 1935, page 5, Col. 3. Newspapers.com, accessed 20 Jan 2018. Mr.s. 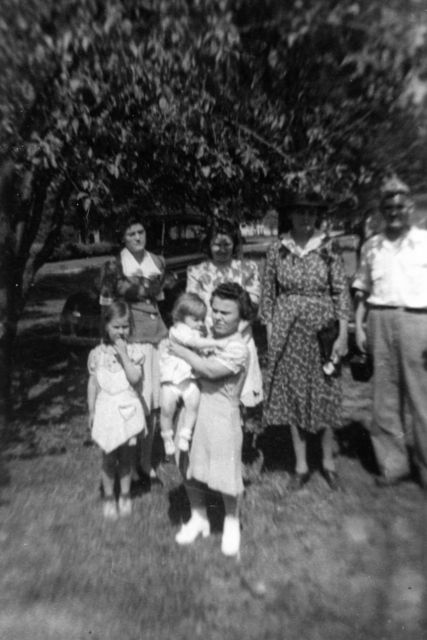 Ray Clarke and daughter, Martha, Mrs Nellie Graham and daughters Josephine and Imogene, were Monday visitors of Mrs. Oscar Robbins and mother, Mrs. Frances Foulke, near Omega. Mrs. Foulke, due to age, is quite feeble. Arthur Foulke, guardian for Mary F. Foulke, in making a report to the court, shows receipts to the amount of $134.29 and expenses in the sum of $931.50, leaving a balance of $2.79. The land of the ward has been leased to O. C. Robbins, the guardian reported. 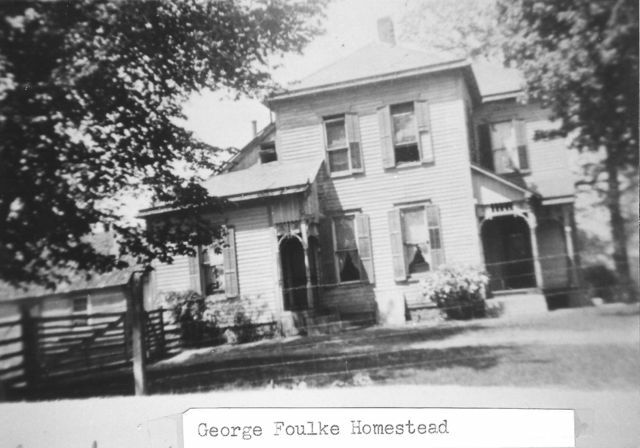 Father: George Foulke, White, born Harrison Co, Ohio, Occupation: Farmer, Residence: Hamilton Co., Ind. Mrs. Grace Robbins, a native of Hamilton County, died Thursday morning at Ball Memorial Hospital in Muncie at the age of 84. 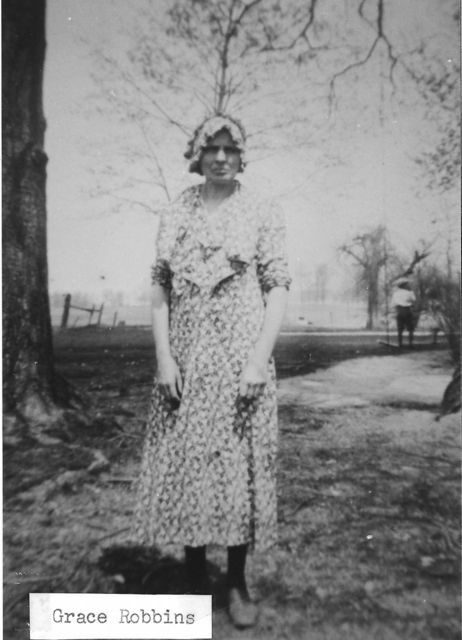 She was born in 1880 in Jackson township, daughter of George and Frances Foulke. She was a 1901 graduate of the Boxley High School and the widow of Oscar Robbins who died in 1959. 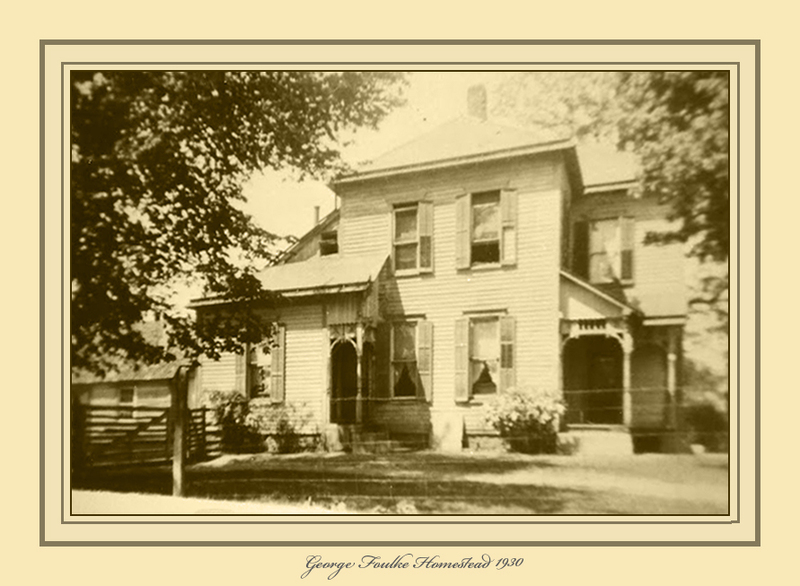 She had spent most of her life in Hamilton County but had been making her home for some time with a daughter, Mrs. Mary Jarrell, of Middletown [Mechanicsburg]. 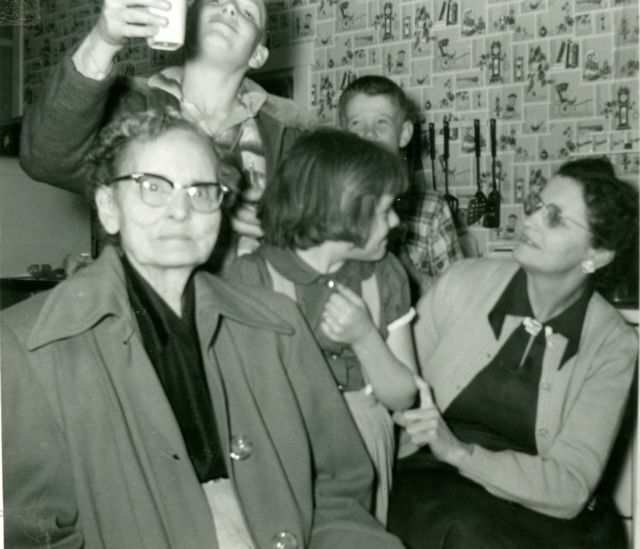 Surviving with the daughter are five other children, Myron, of Sheridan; Ina Henderson, of Elwood; Walter, of Daleville; Esther Robbins, of Muncie; Milton, of Pennville; 14 grandchildren; six great-grandchildren and one sister, Mrs. Sarah Ross, of Cicero. Services will be at 1 p.m. Monday at the Pittman Funeral Home in Eaton, Indiana, with burial in Garden of Memories, Muncie. Friends may call at the funeral home this evening and Sunday. S51 Newspaper Article, Real Estate Transfers, The Sheridan News (Sheridan, Indiana). 2 Sept 1910, page 4, Col. 3. https://www.newspapers.com/image/353600381/?terms=%22Oscar+C.+Robbins%22 , accessed 31 Oct 2018. Doc4565.pdf. - "Oscar C. Robbins et al to William A. Harger. land in Wayne Tp., $8500." 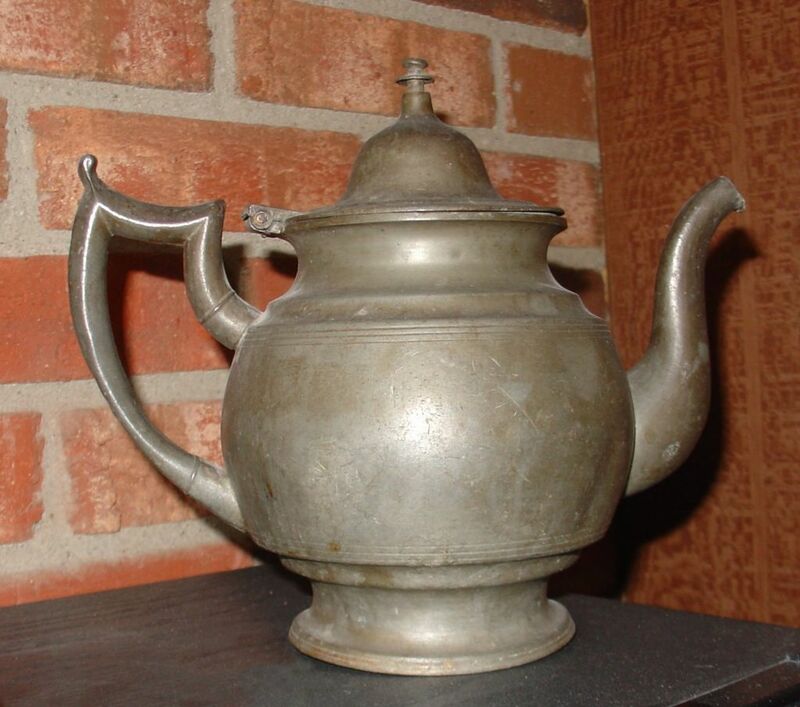 bought by Walter C. Robbins, Sr.
Oscar, Grace, Phil, Janet, Walt Sr., Walt, Jr.
abt 1952 Shirley - Walt Robbins, Jr.